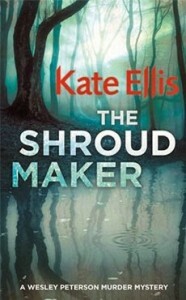 Kate Ellis’s new novel, The Shroud Maker (she is so good at titles) has recently appeared in paperback. She kindly agreed to be interviewed on my blog. I’m lucky enough to be able to write full time so I do regard it as a job. I try to be very disciplined so I start writing at around 10.30 most mornings (after getting all the routine stuff and household chores out of the way). I take a break for lunch and then work through until around 5 pm when hunger gets the better of me. I use the evenings and weekends mostly for relaxing (and possibly bell ringing or archaeology) – although if I have an urgent deadline I will work then too if necessary. It’s different in every book. Sometimes a theme comes first – say obsessive jealousy or a longing for revenge. At other times I’ll come across a story from history which I have to write about…or one from the present day which offers tempting murderous possibilities. Of course I know my series characters very well (almost like real people) but the other characters tend to appear in my mind as I’m writing. History has fascinated me since I was a child. I was never happier than when I was wandering round some National Trust property imagining all the people who’d lived there and how the events of history affected their lives. I suppose my interest in archaeology developed from that. There’s nothing more satisfying than digging up an object that somebody in the past actually held and used. They do say that inside every archaeologists there’s a detective trying to get out so I’ve found it quite easy to include it in my books. As I was growing up I devoured the works of Agatha Christie, Dorothy L Sayers and Ngaio Marsh and then I went on to enjoy the books of Ruth Rendell, P D James, Colin Dexter and Reginald Hill. I do love a good mystery and I must say I favour crime novels that aren’t too cosy but aren’t too graphically violent either – the middle ground where I think I pitch my own books. At the moment I tend to look for books by Peter Robinson, Phil Rickman, Peter Lovesey, Martin Edwards, Ann Cleeves and Christopher Fowler. I also enjoy historical crime by the likes of C J Sansom and Lindsey Davis. I’ve just completed my next Wesley Peterson novel – it’s called The Death Season and will be out next year. I’m also working on a fifth Joe Plantagenet novel.